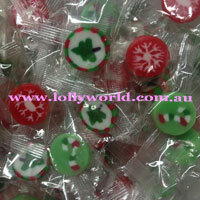 Christmas Treats are individually wrapped boiled lollies with a Christmas theme picture. The pictures are an assortment of Christmas trees, snowflakes and candy canes. The lolly is 2cm in diameter and 1cm thick and have a peppermint flavour. There is 100 in a 500g bag and 50 in a 250g bag. For corporate events there’s also a convenient 500pc box.